Dubai: Two UAE-based retailers – Emke Group and Landmark Group – have been named amongst the world’s fastest 50 growing retail chains by auditing and research firm Deloitte. Emke Group, which operates the region’s largest retail chain Lulu Hypermarkets is the world’s 9th fastest growing retail chain, while Landmark Group has been named as the 16th fastest retailer in the world. They are trailing Amazon.com and Apple Inc — ranked 7th and 8th fastest growing retailer brands in the world, respectively. 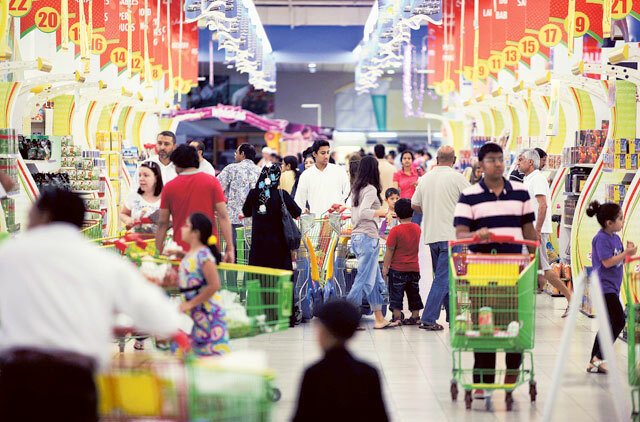 According to Alpen Capital, between 2011 and 2016, the GCC’s retail sales are expected to grow at a compound annual growth rate (CAGR) of 7.7 per cent to reach $270.3 billion by the end of the forecast period. “While the sector presents attractive opportunities, it is highly competitive and retailers need to continue to innovate so that they can achieve sustainable growth and profitability,” Murshed says. Landmark Group, with revenues of $4.51 billion, has been ranked 198th and Emke Group with retail revenues of $4.25 billion, has been positioned 213rd largest in the world. Yusuffali MA, Managing Director of Emke Group, told Gulf News, “The last 4-5 years have been very positive for us in spite of the global slowdown. During this period, we opened 32 new hypermarkets and malls across the region that helped boost our sales to $4.25 billion from $2.4 billion and effectively garnering a market share of around 32 per cent in the organised grocery sector. Their turnover, however, are miniscule to the world’s top two retailer chains — Wal-Mart and Carrefour — whose annual turnover rose to $446.95 billion and $113.19 billion respectively. Despite economic challenges faced by consumers worldwide, the top 250 retailers achieved a 5.1 per cent increase in their sales-weighted, currency-adjusted revenues with an average of 3.8 per cent composite net profit margin, Deloitte research found. “Despite the economic slowdown, composite retail revenue soared for companies based in Africa/Middle East, Latin America and Asia/Pacific,” Deloitte said in the report. “Growth continued to be fuelled by burgeoning middle classes, youthful populations and sizeable foreign direct investment. Both the groups are owned by non-resident Indian (NRI) businessmen based in the UAE. Every year, Landmark Group Chairman Micky Jagtiani and Emke Group’s Managing Director Yusuffali MA swap the top two positions in the list of the most powerful Indian businessmen in the Gulf. While Landmark Group operates more than 1,300 stores across 18 countries in the Middle East and India, Emke Group operates 104 supermarkets, hypermarkets and supercentres in the GCC and India. Emke Group also has a shopping mall development arm, Line Investments that has been building some of the region’s largest shopping mall where its Lulu Hypermarket brand usually drive shoppers and crowds to the shopping centres. Recently, the group has also started a money exchange house, which is expanding fast with the expansion of the group’s shopping mall chain. Emke Group has also developed India’s biggest shopping mall in Kochi in South Indian state of Kerala — near Yusuffali’s home. Although operating as a branded retailer, Landmark Group that operates Splash, Babyshop, Shoe Mart, Centrepoint, Max, E-Max, Iconic, Home Centres, Lifestyle, Beauty Bay among others, is growing at a compound annual growth rate of 23 per cent with a target to cross 2,000 outlets by 2015. It currently employs 40,000 employees. By 2015, the company wants to increase its retail space under management to 29 million square feet, from 20 million at present. The company, which does not operate any supermarket or hypermarket in the GCC, had earlier made a failed bid to secure franchisee rights for French hypermarket chain Carrefour in India. It is currently expanding Auchan hypermarkets in India. As part of the company’s strategy, it aims to raise its annual turnover to $5.2 billion by 2015.